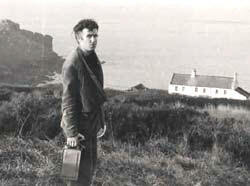 Loss is a significant feature in the work of the Scottish poet W.S.Graham. The theme is most overtly dealt with in some of his best known poems: the elegies for his deceased friends, entitled The Thermal Stair (for the painter Peter Lanyon, killed in a gliding accident), Lines on Roger Hilton's Watch, and Dear Bryan Wynter. A constructed festival of pulleys from sky. Thomas was born in 1914, Graham in 1918, and so such a coincidental influence is quite conceivable. Still, does such historical and biographical evidence hold when we compare it to the poems and furthermore what does all this have to do with loss? Twinned with a dawn and a dark. Chimed in the dandelion tower. Wording the world awake and all its suns. It seems that in this poem Graham achieved what he had been struggling to achieve in the earlier poems: he touches the inscape of the sea, embodies it in language just at the point in which he seems to abandon this quest and turn to a style which is more concerned with language as language, as opposed to language as embodier of thing. Graham turns from attempting to word the world awake to a poetry which questions the word itself. We see here the beginnings of Graham's loss of the world. Of Spring are drenching the window-glass. In a cloud wanting to say something. I have made myself alone now. Believe in us. If we could only find them. 1 Dennis O'Driscol, W.S.Graham: Professor of Silence, in Eds. Ronnie Duncan and Jonathan Davidson, The Constructed Space: A Celebration of W.S.Graham. (Jacksons Arm. 1994) p. 52. 2 Carcanet Press archives at The John Rylands Library, Manchester. 3 Ed. Walford Davies, Dylan Thomas: Selected Poems, (J.M.Dent and Sons, 1974), p15. 5 Ronnie Duncan, W.S.Graham; A Reader's View, op. cit, p. 16.